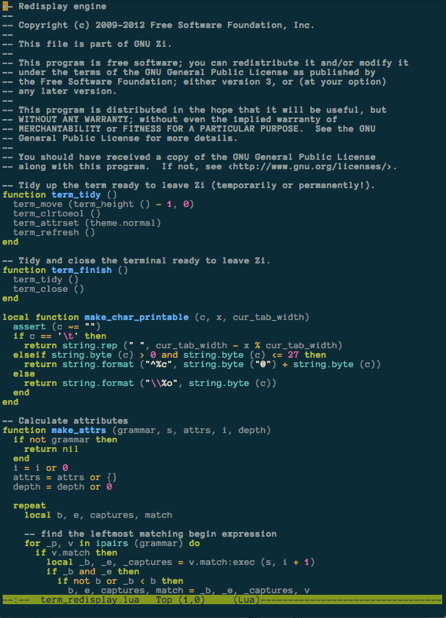 Zile is a collection of algorithms and data-structures that currently support all basic Emacs-like editing features: it is 8-bit clean (though Unicode support is not ready yet), and the number of editing buffers and windows is only limited by available memoryand screen space respectively. Registers, minibuffer completion and auto fill are available. Zile can be found on the main GNU ftp server: http://ftp.gnu.org/gnu/zile/ (via HTTP) and ftp://ftp.gnu.org/gnu/zile/ (via FTP). It can also be found on the GNU mirrors; please use a mirror if possible. 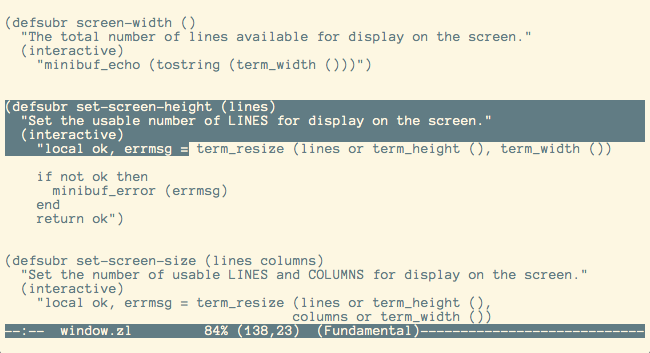 Like Emacs, Zemacs is self-documenting: it has built-in help on its features. It also comes with a brief man page, obtained by running man zemacs, and a FAQ, which can be found by running zemacs and typing the key-sequence C-h C-F.
Zile has two mailing lists: <help-zile@gnu.org> and <bug-zile@gnu.org>. The main discussion list is <bug-zile@gnu.org>, and is used to discuss most aspects of Zile, including development and enhancement requests, as well as bug reports. There is a separate list for general user help and discussion, <help-zile@gnu.org>. Announcements about Zile and most other GNU software are made on <info-gnu@gnu.org>. Development of Zile, and GNU in general, is a volunteer effort, and you can contribute. For information, please read How to help GNU. If you'd like to get involved, it's a good idea to join the discussion mailing list (see above). For development sources, bug and patch trackers, and other information, please see the Zile project page at savannah.gnu.org. Zile is currently being maintained by Gary V. Vaughan. Please use the mailing lists for contact. 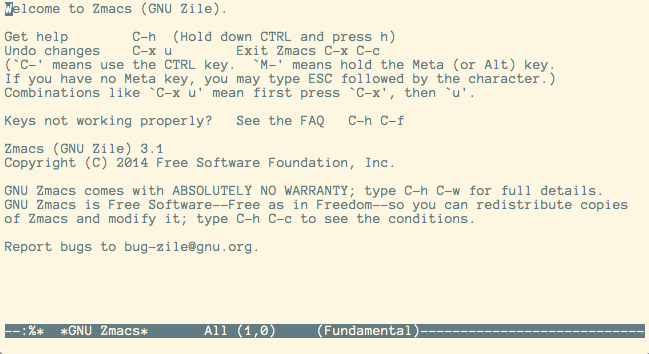 Zile is free software; you can redistribute it and/or modify it under the terms of the GNU General Public License as published by the Free Software Foundation; either version 3 of the License, or (at your option) any later version. Please send general FSF & GNU inquiries to <gnu@gnu.org>. There are also other ways to contact the FSF. Broken links and other corrections or suggestions can be sent to <bug-zile@gnu.org>.